In beautiful, unsentimental, and surprisingly funny prose, Stephanie Wittels Wachs alternates between her brother's struggle with addiction, which she learned about three days before her wedding, and the first year after his death, in all its emotional devastation. This compelling portrait of a comedic genius and a profound exploration of the love between siblings is A Year of Magical Thinking for a new generation of readers. 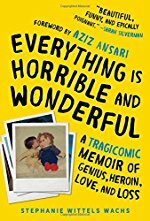 A heartbreaking but hopeful memoir of addiction, grief, and family, Everything is Horrible and Wonderful will make you laugh, cry, and wonder if that possum on the fence is really your brother's spirit animal. How do you read a book that makes you want to laugh and cry and drink all at the same time? I pre-ordered this book months ago and started reading it the second it was delivered today, but despite being a fast reader, I'm having to rest between chapters because it's a lot to take in. Is anyone else out there reading it? I'll add it to my list. Thank you for putting it on my radar! Ok, I read it. It was an interesting showcase of a broken heart and an enduring spirit. If anyone cares to answer, I wonder how you would answer the question: what is the basis of Harris' addiction? That's an excellent question and I honestly have no idea what the answer could be. Usually addiction is based in trauma and Harris' life seemed pretty good, although it sounded like he had a distant father and a bit of a smother. Although according to Harris himself on one of the times he appeared on Pete Holmes' You Made it Weird podcast he was sexually active from a pretty young age (like 12 or 13). That's a bit of a red flag for me as well. But Harris also had chronic back pain and maybe he just really enjoyed the feeling of being high. At this point, we'll likely never know.